Former President Mary Robinson and novelist Edna O’Brien were among the 25 women celebrated last night. 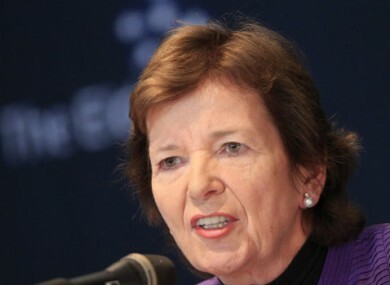 TWENTY-FIVE OF IRELAND’S most powerful women including former President Mary Robinson and the State Pathologist Prof Marie Cassidy were honoured at a new awards ceremony in Dublin last night. Co-presented by the Women’s Executive Network and HSBC Ireland, the awards celebrated Irishwomen who are leading the way in their various sectors, from science to business. Award winners include Ireland’s first female Attorney General Máire Whelan, Deputy Commissioner Nóirín O’Sullivan, novelist Edna O’Brien and broadcaster Marian Finucane. The event organisers say that there was no nomination process for the inaugural awards which covered five categories, and they noted that the low number of women who met the criteria for the Entrepreneurs Award (she must have founded the company, actively manage daily affairs as the top executive, and own at least a quarter of the company’s shares) shows that while many women are launching their own businesses, it is difficult to launch them on a bigger scale. Speaking ahead of the awards, WXN founder Pamela Jeffrey said that while some of the winners had not sought a higher profile, they were identified by the event organisers “purely for the work and the role they play within some of Ireland’s largest companies”. Email “Ireland's '25 most powerful Irish women' honoured”. Feedback on “Ireland's '25 most powerful Irish women' honoured”.